Hey there! 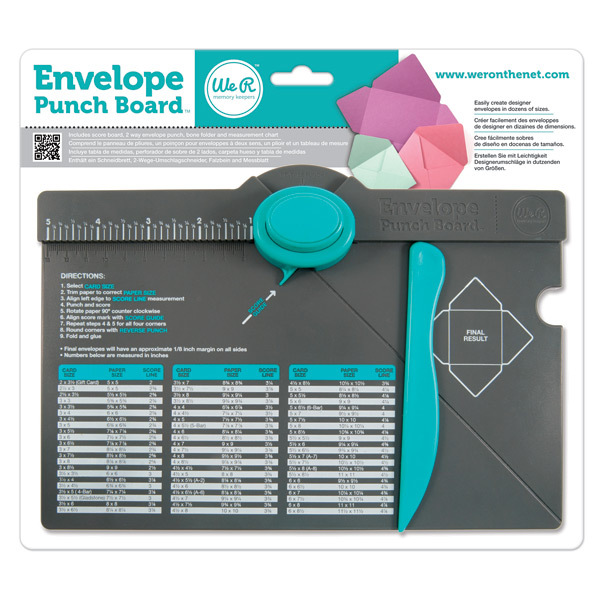 Today I am sharing with you the Envelope Punch Board by We R Memory Keepers. Enjoy! What do you think? Is this a tool that you would use? Let us know! P.S. You can punch the flaps using the punch at the top if you don't want to trim them with scissors. Thanks for reminding me Shirley! I just got this as well and I'm a fan! Instead of snipping the corners with scissors at the end, couldn't you just use the corner punch built into the board (at the top of the punch)? I need this. I saw it, hmmm, at the CHA I think. It would be great because I make a lot of cards! I have had my board for almost a month...and I don't know how I got along without it. I love it. If I could wish for one thing about is that it would be about 2 to 4 inches larger. Just bought this at Archiver's....for around $10 after a coupon. Watched a demo there and loved it! I have seen others using this. It looks like an interesting tool!